When the last of the Remnant is murdered at the Sagrada Familia in Barcelona, Arkane agent Dr. Morgan Sierra is drawn into the hunt for a supernatural Key. She's joined by Agent Jake Timber, who must face his own fears as they decipher clues left behind by Kabbalist scholars. From ancient sites in Spain to Israel and the Czech Republic, Morgan and Jake must follow the trail to the Key while evading Adam Kadmon, a man consumed by a lust for dark power. I never read this author's works previously, the title was intriguing, so I asked to read it for review. I love audio books, but sometimes I doze off, etc...which I did...but this was good enough to make me back up and listen to it all. I was intrigued by the subject matter (Jewish supernatural ideas) which I don't see too often. The performance was very well done...especially since a woman narrator had to do male voices, and did them quite well. I know I will want to read more with these characters...it is obvious there is a lot going on with them and there were just enough hints to make me curious. All around, a great read/listen. An amazing thriller that travels the world and walks the thin line between the real and surreal. I read the book when it was first published, but since I got an extra credit for re-joining audible, I thought I'd give this a go as an audiobook. Listening to the book I was taken on a journey with even more depth and fine storytelling than in the reading. A good night's sleep was lost on this one, and without regret. It begins when Rabbi Santiago Pereira falls to his bloody death at the feet of the sculpture of Christ on the Sagrada Familia basilica in Spain. He's been running in hopes of escaping a man, now known as Adam Kadmon, determined to know where the Key to the Gates of Hell is hidden. Hell is real in the world created by Penn, and there is a key. It can fall into the wrong hands. The rich details of the book become more vivid in the audiobook, which I hadn't expected, and the tension keeps growing until the terrifying end of the book. Penn's writing is so well done that there isn't a moment when the fear of God and hell don't scare the living daylights out of the listener. Angels and golden letters, a Golem and rituals of ancient Jewish mysticism mix with one tough lady for quite an adventure. I was a bit surprised by the narration. I would have expected the weight of the subject matter to be told by by a deeper, more threatening voice. But as the action ramped up, so did the narrator's intensity. It was very well done, just a surprise at first. I'd highly recommend this audiobook for anybody dealing with a boring commute or in need of something that keeps them focused as the world around them disappears. Simply fabulous. Penn is a past master in the art of imagery. Once again, history, localities, religion, and fantasy are combined to bring us further riveting adventures of ARKANE. Morgan Sierra and Jake Timber work together once again, and the artifact at the center of the action and adventure is of the Jewish lore. It involves matters of personal significance to Dr. Sierra which are best described by the author. Nevertheless, be assured that all becomes clear under the author's pen, and that the intensity of the ARKANE is maintained. See publisher's summary for basics without spoilers. The narrator's delivery is adequate, but not on a par with the material. I feel that the print is superior to the audio in this case. Book 6 is an excellent addition to the tale. The fast paced novel takes Morgan back into her past as she helps save the future. It was great to see Jake again. I listened to the whole thing in one sitting. Can't wait to get the next adventure. I loved the audio book it was fast paced and I learned things I did not know. The narrator is fantastic. This is a story about family ties,numerology and religious ideologies. Morgan is thrown into a maelstrom when the last of the remnants is killed and she recieves a letter from her dead father.It was written long before he died.She is now the only one to find the 'key' and prevent Adam Kadmno,a vicious man who has personal history with her family,opens the gates of hell. 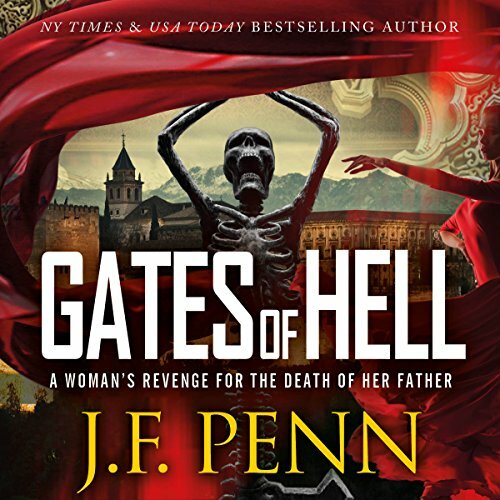 Where does Gates of Hell rank among all the audiobooks you’ve listened to so far? What was one of the most memorable moments of Gates of Hell? Joanna has written another great story featuring Arkane agent Morgan Sierra, along with Jake Timber, as they try to find a supernatural key that opens the gates to hell. Adam Kadmon is set on getting to the key first and opening the gate. this dirty is exciting up until the very end. I received a review copy of this book but it in no way influenced my review. I would to someone who liked this genre. It is a high octane adventurous ride. Mikhail. He was the ultimate classical hero. Altruistic, tragic and self sacrificing. He will be the key to defeating Adam. She did a good job with the accents and with giving the various characters their own unique individual voices. Yes it full of action and suspense and could be listened to in one sitting. Louise now calling himself Adam Kadmon has a major chip on his shoulder and hates all of mankind. He is intent upon opening the gates of hell and bringing the world into darkness, chaos and destruction. He was bullied as a child, maimed by one of his tormentors and rivals as a young man and then scorned in love. He vows vengeance not only on the perpetrators of his misfortune and anguish but also on all of mankind. His once beloved teacher and mentor, who was the father of the girl who scorned him is a respected member of a brotherhood of rabbis who specialize in the occult that are called the Remnant. Before Adam kills this Rabbi he gets a message out to Dr. Morgan Sierra. Adam is wiping out the Remnant of which Morgan's father was a member and one of Adam's victims. Morgan and her companion Jake set out on an Arkane mission to thwart Adam and destroy the key to the door to hell. They will be joined by Morgan's father's apprentice and successor Mikhail. This well written and developed book was full of action and suspense. There are sexual sparks between Morgan and Jake, although they maintain a professional relationship. This was the first book I've read/listened to in the series and I do need to go back and listen to the preceding books. If you like an exciting adventure fantasy thriller then this book would be a good choice.